Another day of the Xmas break is over. . .
Today I went grocery shopping with my mom to get all the stuff for dinner tomorrow. We went to The Egg Store. They have cheaper produce than fsf does. I think we might start shopping there. They had pineapples for only 99 cents! For desert we are having vanilla ice cream with egg nog liquer. Romy didn't get donuts today. He was gonna bring them into work, but he thought a lot of people would bring donuts. Well, no. . . nobody did! Oh well. I kinda wanted one. I added a few more thing to the blog. I have a little message tag board (under ~+ say hi! ), which you can leave me a message or talk to someone who is also online, like an instant messager, but the bad this is it doesn't auto refresh. You gotta pay extra for that! I finally finished cutting the tiles around the outlet in the kitchen. Once I got the right bit for the dremmel, it was quick and easy. But ceramic dust sprayed all over the basement, and I had to vacuumn it up. And I also wrapped the gifts. Now all that's left to do is the fruit baskets. Just add the fruit! Oh, and I got an e-mail from Anie today. 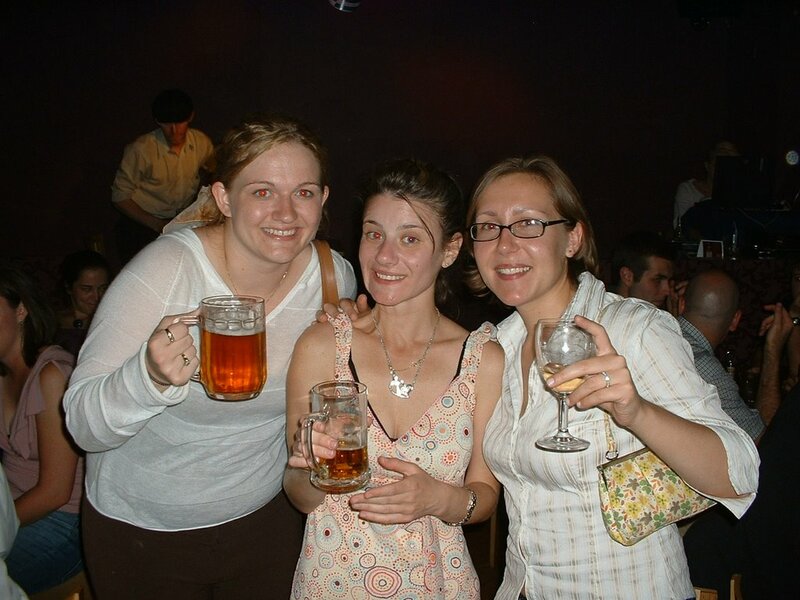 She was in my TEFL course in Prague (and she is in the center of the photo, pink dress). She's from Lebenon, but she prefers to live in Cyrus (no kidding!). Well, she just told me that she started studying for a PhD at Charles University in Prague, and she is also teaching English and French. I am so jealous! Thats awesome! That pic was taken at the "going away" party after our course was done, at the Tulip Cafe in Prague. It was a place that all TEFL teachers get 25% off, so we went there a few times. It is owned by a guy (Party Ray) who came to teach English, but decided to go into the bar business instead. Oh well! Whatever floats his boat!